The rhythms of the village were driven by old traditions, religious beliefs, agricultural practices, and the changing seasons. Norka street scene in 1912. Photograph courtesy of Lois Klaus. The year began in the depths of the cold Russian winter with boisterous Neujahr (New Year) celebrations. As they waited for spring planting, men repaired wagon and tools and tended to the animals. Many families earned extra money by weaving sarpinka. Despite the cold weather the night watchman continued their vigils. Each of the main east-west streets in Norka had it's own night watchman and their headquarters was located in the northeast corner of the colony. Houses were cleaned every Saturday and before holidays. The windows, floors, and the front porch of the houses were scrubbed. Ovens were also cleaned. Both the house and the yard were cleaned during the summer months. A great deal of information (church services, end of the work day, prayer meetings, deaths, fires) about notable events in Norka was communicated throughout the village by the ringing of three bells in the bell tower. Religious practices were observed my nearly everyone in the colony and especially during the Sunday worship rituals. People paraded through the streets to the church each week in their finest clothing. As the service began the walls of the sanctuary vibrated with the sound of the organ and enthusiastic singing of hymns from the Wolga Gesangbuch (Volga Songbook). The Große Fasten (the Great Lent) began on Ash Wednesday which was 40 days before Easter. It was a time of self-examination, self-denial, and preparation for the Holy Day of Easter. The Lent season begins after Fastnacht. In Norka, as with all the Volga German colonies, there were no public weddings and no parties during the solemn season of Lent. The Christian Holy Week leading up to Easter made it a special time of year and one of the most important holidays in Norka. On Palmsonntag (Palm Sunday), the entire congregation took communion at the church with the new confirmands who were practicing this ritual for the first time. The days leading up to Gründonnerstag were very festive (in English, the day is known as Holy or Maundy Thursday, in German it is known as Green or Mourning Thursday). All celebrations ceased on Gründonnerstag when services were held in the church as they were again on Karfreitag (Good Friday). If Easter wasn't too early in the season, the men would go out to the fields in the evening to get a head start on plowing and sowing. There were tensions between the three different parts of the colony: the Oberdorf (upper village), Mitteldorf (central village), and Unterdorf (lower village). The wealthier people lived in the Mitteldorf and the less wealthy in the Oberdorf and Unterdorf. Sometimes teasing would turn into fights between young boys. Pressure to conform to social norms was high, but crimes did occur on occasion and a jail, known as the Kalmuckenhaus, held the wrongdoers for a time. 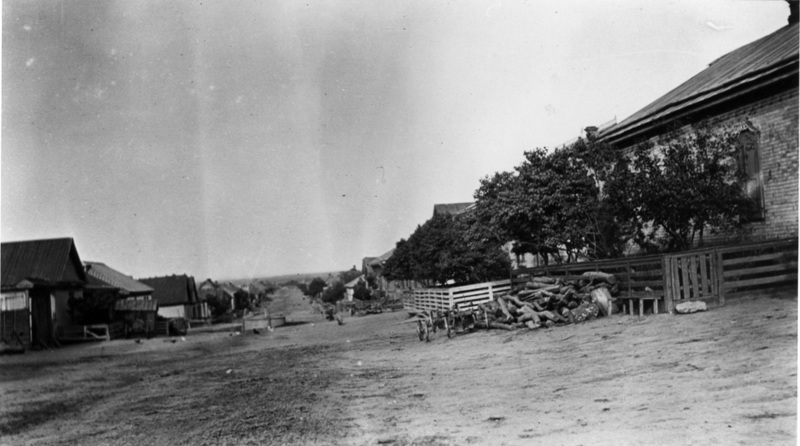 The village courthouse was located in the first row of streets, next to the jail and post office. Agriculture was the primary activity that sustained the colony of Norka. In preindustrial agricultural societies, children were a valuable, productive asset – even a six-year-old child could carry out essential household tasks. The need for helping hands, combined with a lack of modern contraceptives, led to large families despite relatively high infant mortality rates. Farm work began in the spring as the snows melted revealing a growth of winter rye in at least one of the large colony fields. Sunflowers, spring grains, and potatoes were planted in late March and April. Millet was the third most important grain crop in the colonies and was also sown in the Spring. Oats and barley, both used mostly as animal fodder, were also spring crops. During the spring thaw, along the banks of the Volga and the mill ponds, the colonists would collect irregular blocks of ice, insulate them with straw, and store them in large cellars in order to preserve their dairy products and fresh meat during the hot summer months. Not everyone worked as a farmer. Norka had several mills, tanneries, blacksmiths shops, taverns, and other enterprises. 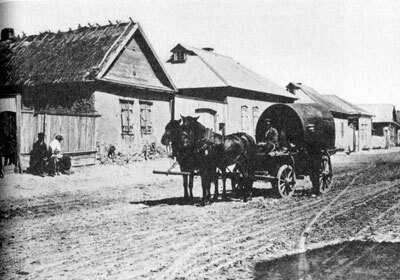 Some goods were bought and sold in the city of Saratov, which was a two day journey by horse and wagon. Other supplies could be purchased at the Volga River port town of Schilling. The celebration of Pfingsten (Pentecost) is observed seven weeks after Easter Sunday. On the Saturday before Pentecost, the house was thoroughly washed and cleaned. White sand was spread in the yards, pathways, and streets. Houses and the church were often decorated with birch branches, flowers, and green wreaths. The primary symbol of Pentecost was the Maibaum (Maypole), typically a tall birch trunk decorated with green branches, wreaths, ribbons, and scarves. Maypoles were placed in the ground near the church and homes of highly respected people (pastor, schoolmaster, teachers, business owners) who often gave 50 to 100 kopeks to those who set up the pole. The holiday of Pentecost was celebrated for two days because it came at the time of the hay harvest when much work had to be done. The founding of the colony was commemorated each August 15th as a public holiday which was known as Herkomst Tag (Founder's Day). Harvest began in late summer or early fall and all family members were engaged in the strenuous work. Families traveled for miles from their homes to their allocated land. 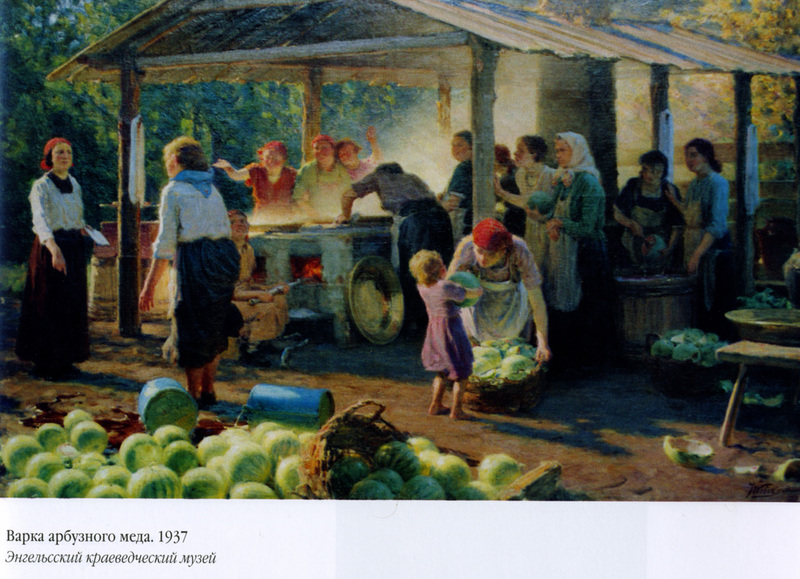 Painting by Jakob Weber of Volga German women making watermelon syrup (1937). From the book "Talent from the Volga - Jakob Weber" by Vera G. Choroshilowa (2005). Families gathered for an annual butchering bee in November or early December. Fruit tree cuttings were used to smoke sausage and other meat products made by the colonists. With the long harvest season over, fall plantings completed, and produce sold or stored, the villagers gathered to celebrate their bounty in an exuberant festival, the Kerb. This event signaled the end of the field season as the people prepared for the long Russian winter. While the Kerb could be a raucous celebration shunned by the church leaders and Brethren, a more temperate Harvest Festival was held concurrently. The Harvest Festival in Norka included an annual public market (Jahrmarkt) where all types of goods could be bought and sold. With Winter's approach, they people of Norka became more isolated on the steppe and were largely self-sufficient until the next Spring. Weihnachten (Christmas) was the most eagerly anticipated religious and social festival in Norka. It was a time to observe old traditions brought from the German homeland which were influenced by the environment on the Lower Volga. It was a magical time in Norka with much food, singing and celebration. Advent, the beginning of church year, starts on the fourth Sunday before December 25. With the arrival of Advent Sunday, the Christmas season officially began. The Christmas season was also a time of weddings. Many marriages took place during the week between Christmas and the Neujahrsfeier (New Year's celebration). The traditional wedding date was the second day of Christmas (December 26th) when multiple couples would gather to take their marriage vows.